Researchers at the International Research Organization for Advanced Science and Technology (IROAST) in Kumamoto University, Japan, focused on a "catalytic combustion method" to solve the NH3 fuel problems. This method adds substances that promote or suppress chemical reactions during fuel combustion. Recently, they succeeded in developing a new catalyst which improves NH3 combustibility and suppresses the generation of NOx. The novel catalyst (CuOx/3A2S) is a mullite-type crystal structure 3Al2O3·2SiO2 (3A2S) carrying copper oxide (CuOx). When NH3 was burned with this catalyst, researchers found that it stayed highly active in the selective production of N2, meaning that it suppressed NOx formation, and the catalyst itself did not change even at high temperatures. 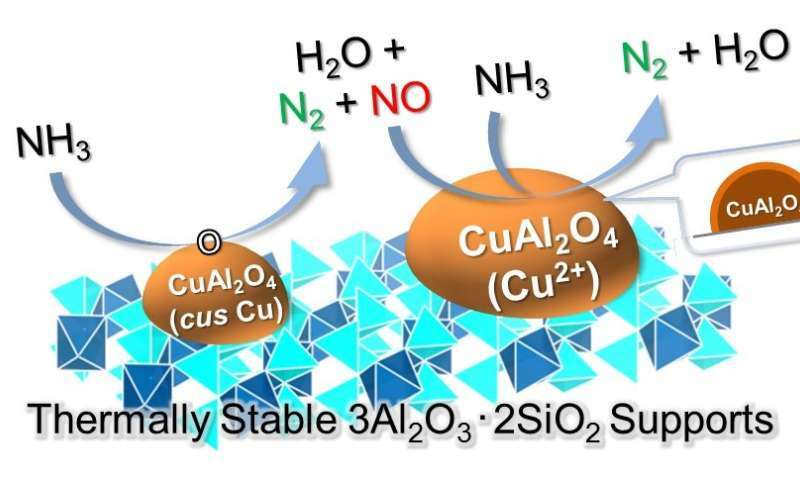 Additionally, they succeeded with in situ (Operando) observations during the CuOx/3A2S reaction, and clarified the NH3 catalytic combustion reaction mechanism. This research was posted online in the Journal of Catalysis on 26 March 2018. Once again there is a complete breakage between research and reality. First of all, ammonia doesn't crow on trees. It is synthesized using notrogen and hydrogen. Hydrogen generated from shift reaction: water + carbon (natural gas) to generate CO and H2. Thereis an energy penalty associated with this, and the splitting reaction generates CO + H2. OK, now the formation of NH3 from N2 and H2 requires energy (think of heat of formation of ammonia). This requires an energy input. So, two parts of the process require an energt input: Generating H2 and synthesizing ammonia, and you only get out one energy output. Overall, ammonia combustion is an energy consuming process. Any research like this should supply the overall energy balance, and not just saying "assume we have a supply of ammonia". Also, ammonia is toxic. I was a project manager for an air pollution project for two power plants where we supplied liquid anhydrous ammonia storage and vaporization systems.